USPTO Acknowledges the Proprietary Nature of QuestFusion LLC Products and Services Related to Business Strategy and Planning. 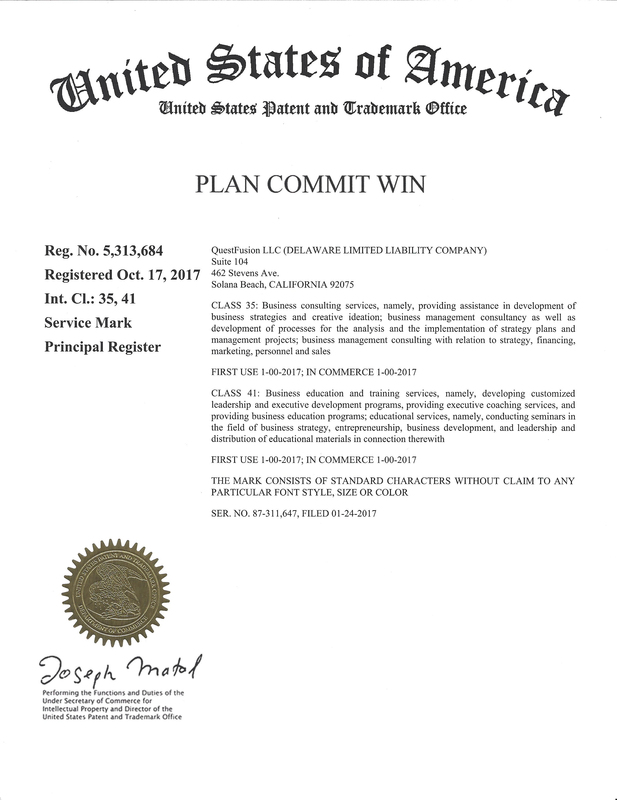 The registration of the mark on PLAN COMMIT WIN with the USPTO give QuestFusion LLC the right to affix the wording “Registered in the U.S. Patent & Trademark Office,” “Reg. U.S. Pat. & Tm.” or the symbol ® to the mark when used in connection with the services listed on the Certificate of Registration. CLASS 35: Business consulting services, namely, providing assistance in development of business strategies and creative ideation; business management consultancy as well as development of processes for the analysis and the implementation of strategy plans and management projects; business management consulting with relation to strategy, financing, marketing, personnel and sales. CLASS 41: Business education and training services, namely, developing customized leadership and executive development programs, providing executive coaching services, and providing business education programs; educational services, namely, conducting seminars in the filed of business strategy, entrepreneurship, business development, and leadership and distribution of education materials in connection therewith. To learn more about QuestFusion strategy and business consulting, executive coaching, and PLAN COMMIT WIN® Membership, and how they can help you expand and grow your business, please visit our website at http://www.questfusion.com.